Home > Patriotic > Cameo Proudly Served Magnet Large 4"x8"
Our large version of our "Proudly Served" Cameo Ribbon magnets. 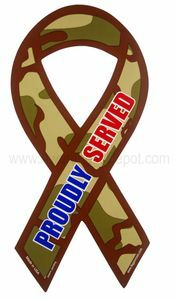 These are larger versions of our camouflage ribbon magnets with the words "Proudly Served" in blue and red on one of the legs. Great way to show your pride in your past service.